A screen shot from the "March madness"-style bracket competition organized by the life sciences news site STAT. Help boost Emory HIV research by going to the STAT site to vote! 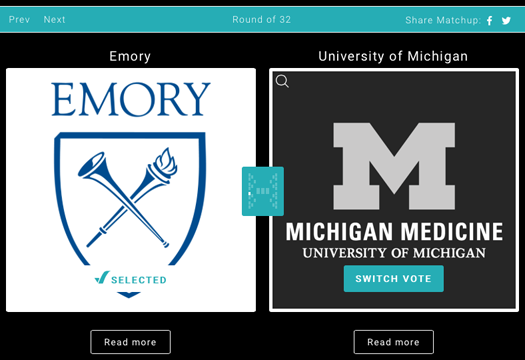 Emory is participating in a "March madness"-style bracket competition organized by the life sciences news site STAT. Instead of basketball teams, the competitors are biomedical researchers. Members of the Emory community can go to the STAT site and vote. Ask your friends and colleagues to do the same! STAT asked for universities' top biomedical innovation from 2016. Emory's entry is a Science paper, in which researchers showed that monkeys could keep the HIV-like virus SIV at bay for months or years, without standard antiretroviral drugs, after treatment with an antibody. Usually, HIV comes back quickly if someone stops taking the drugs that keep the virus under control. A similar antibody is already FDA-approved for the treatment of inflammatory bowel diseases, and a clinical trial of that antibody in HIV-positive people is underway at the National Institute of Allergy and Infectious Diseases (NIAID). Emory pathologist Aftab (Tab) Ansari led the project, together with NIAID director Anthony Fauci. A full description of the results is available here. Last fall, the findings were hailed as opening up new possibilities for long-lasting treatments for HIV. Fellow researchers described the Emory scientists' work to Science's news section as "fascinating," "a complete first," "striking," and even "too amazing to be real." The voting started on Monday and by Tuesday morning, STAT's bracket site had recorded more than 15,000 votes. This week, we are matched up against the University of Michigan, but that could change if Emory progresses to the later stages of the competition. The first round of voting closes on Thursday night.